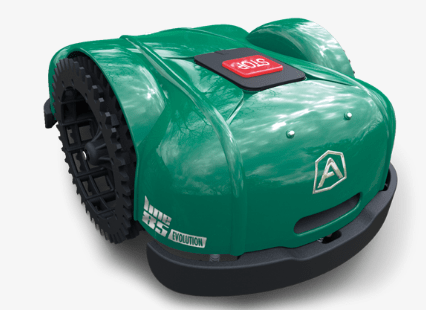 To keep your Ambrogio mower in the best possible condition during the mowing season, you are going to have to do some maintenance work. But don’t worry there are only a few jobs to do, all are very easy and I’ll be explaining them all here. They will ensure your mower is working to its full potential all year round which will only benefit your garden. So make sure to carry them on a regular basis. Also, refer to your user manual for further guidance. This should be carried out on a monthly basis – and even more frequently during the wetter months. Because your mower is out there so frequently, it will gather up a load of grass and debris in its wheels and blade (which is made much worse because of its size). This slows down the speed at which the mower mows and will just use up more power than usual. Both resulting in a poorly cut lawn and probably higher charging costs. I know you won’t want that so make sure you follow what I say. First put on a pair of protective gloves, turn off the mower and flip it so the blades are facing the sky. This lets you clearly see how much cleaning you’re going to need to do. Now with a dry brush, start rubbing away at all the grass stuck around the blades (be careful! ), in the wheels and around its sides. Do not use any water as this can damage its electrical system. Once a bunch of it has been scraped off, start pulling all the grass out of the mowers underside. If you still think there is some debris left then tip the mower back onto its wheels and the rest should fall out – you may need to give it a shake. Now go over the underside again with a damp cloth to try and get all the bits you missed. Once you think you’ve got it all, you can start cleaning body of the mower. Now do not use a power cleaner or hose for this, you will just damage the robot. Instead use a damp sponge with some mild detergent to rub off all the dirt and grass – make sure to squeeze out the excess water first. And that’s all, your mower will ready to go and will be fully functioning. Also, remember to clean the charging station as well. All you need to do is remove any debris from the inside of the base and give the contact plates a good scrub. Whenever you notice that the quality of the cut getting poorer – the tips of the grass will start going brown – then it will be time to change the blades. But don’t feel the need to wait for this to happen. If you check the blades every time you clean the mower then you will probably catch it beforehand. When checking, look out for any scratches that may have appeared and if the edges have begun to go blunt. This is when you know they need changed. You can follow this process below to understand how to change them but make sure to refer to the user manual as well. Always make sure you’re wearing protective gloves whenever coming into contact with blades. You don’t want to make an accidental trip to the A&E do you? Now flip the mower over again like before, making sure not to damage its body. Then with a screwdriver, remove the screws located in the middle of the blade and then remove the blade itself. Now with the new blade and screw, reattached both parts. Make sure the blade is on firmly so it doesn’t wobble. You can now tip the mower back over onto its wheels and let it begin mowing again. To make sure your mower is safe during the off-season, you’ll need to carry out the steps below. All should be done on the final day before packing up shop. Bring the mower and its charging station inside and store them in a dry place that is not vulnerable to frost. If you make sure to follow these tips then your mower will be working as good as new at the beginning on spring. But if you are having any technical problems then make sure to get in contact with your dealer. If you want your mower to operate to its fullest potential then you must carry these processes out on a regular basis. Otherwise your lawn will suffer and you will just be wasting money.